Inferno is now showing and is distributed in Australia by Sony Pictures. Dan Brown's fast-paced suspense novels that typically tread a fine line between fact and fiction almost beg to be adapted into screenplays. So why aren't they working so well on the big screen when they are so popular among readers? Inferno is just fine. Like the book of the same name, it follows the same pattern of those which have come before it...with a few minor differences. 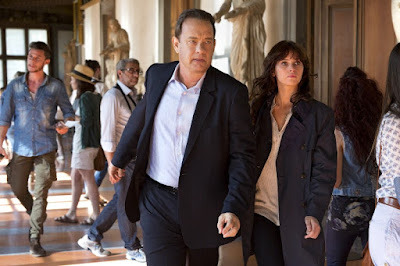 Robert Langdon (portrayed once again by Tom Hanks), the Professor of Religious Iconology and Symbology at Harvard University who has such a strong pull to dangerous situations, wakes up in a Florence hospital recovering from a gunshot wound with no recollection of how he arrived there or in the city. With the help of Dr Sienna Brooks (Felicity Jones), Langdon attempts to solve the puzzle set out for him which heavily involves Dante's "Inferno", as well as trying to understand why his life is in danger thanks to those who are following his every footstep. For The Da Vinci Code in 2006, the order of the day was over-expectation considering how astronomically successful the book was. Despite the film not being well-received by critics, it performed very well at the box office as all those who read the Dan Brown book flocked to see Ron Howard bring it to life. 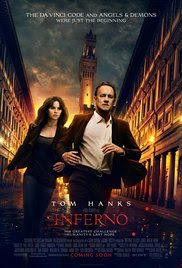 Much the same occurred with Angels and Demons in 2009, so why not bring Brown's sixth novel, Inferno to the screen? Inferno is high paced and entertaining for the most part and intriguing enough to keep your attention for it's entirety. However, as stated before, the small details are not enough to make the film feel original by any means. Any reader of the Brown books and those who have seen both The Da Vinci Code and Angels and Demons, it is inevitable that there will be at least four twists in the story and these twists may be predictable in their occurrence, but the good news is they are still unforeseeable in nature. And of course, there's a whole lot of facts about historic places and artefacts thrown in there as the books can often feel as though they are a regurgitation of a "Did you know?" history book. However, this is one of the reasons why people still do flock to see these films as it is like having a guided tour of such locations....with the tour guides constantly running from the bad guys. Florence and Venice are on show in exquisite fashion. If you are planning a holiday to these cities, than Inferno may work as a great tool for what to see with a whole set of trivia attached to it (as what The Da Vinci Code did for Paris and Angels and Demons for Rome). There are some truly beautiful landscape shots, but the depiction of Dante's "Inferno" on Earth is downright terrifying. Tom Hanks is solid in his third outing as Robert Langdon. He gives a flawless performance of the character of Robert Langdon, which he has moulded to be his own over the past three films. Felicity Jones has bee given the job of portraying a character who is not particularly interesting until the last third of the film and as would be assumed, her performance hits it's stride at this time. One of the best things about Inferno is it's depiction of the "bad guys". The film correctly shows that most of the time in real life, the people who are perceived as being the enemies always believe that they are the good guys and are doing the right thing, as is shown here. Inferno is entertaining, but is just another film in the now tired series of Dan Brown adaptations.